Belsize Park is a London Underground station in Belsize Park, north-west London. It is on the Edgware branch of the Northern line, between Chalk Farm and Hampstead stations, and is in fare zone 2. It stands at the northern end of Haverstock Hill. In July 2011 it became a Grade II listed building. The Royal Free Hospital is located a short distance to the north of the station. 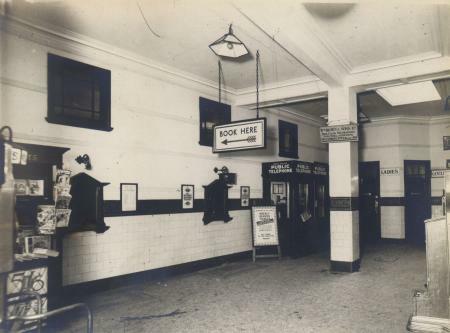 The station was opened on 22 June 1907 by the Charing Cross, Euston & Hampstead Railway as an intermediate station on its line from Charing Cross to Golders Green. It is served by three lifts which descend 33.2 metres (109 ft) to the platforms. The platforms can also be reached by stairs; there are 219 steps according to the sign in the station. The station was designed by Leslie Green and has his familiar facade of ox-blood faience with five round arched windows. It remained largely untouched until the late 1980s when the lifts were replaced and a new ticketing system installed. Belsize Park is one of eight London Underground stations which have deep-level air-raid shelters underneath them. The shelter was constructed in World War II to provide safe accommodation for service personnel. Entrances to the shelter are at the junction of Haverstock Hill and Downside Crescent and off Haverstock Hill. London Buses routes 168 and C11 and night route N5 serve the station. ^ Historic England. 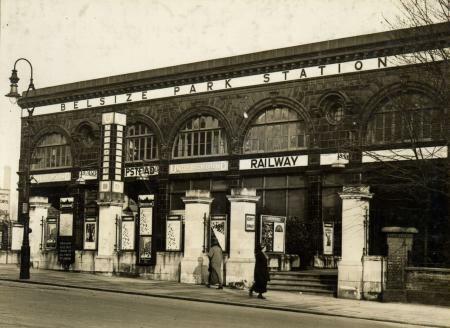 "Belsize Park Underground Station including forecourt walls, gatepiers, gates and railings (1401089)". National Heritage List for England. Retrieved 3 April 2015. ^ "16 London Underground Stations Listed At Grade II". English Heritage. 26 July 2011. Archived from the original on 14 September 2011. ^ Emmerson, Andrew; Beard, Tony (2004). London's Secret Tubes. London: Capital Transport Publishing. ISBN 1-85414-283-6. Standard design was also employed when an outside door was part of the build for access to the upper floor(s). A triangular pediment above the doorway and fanlight were the norm. The cartouche employed at Belsize Park as a decorative touch along the first floor level is an identical design to those at Hampstead. The complete design in the repeated platform frieze. As part of the station upgrade the platform tiling was replaced although the tone of the new tiles is darker than the originals. "Visit to Belsize Park deep level shelter". Subterranea Britannica. Archived from the original on 2001-06-05. Abraham "Abe" Lazarus (1911–1967) was a British Communist activist. Lazarus contracted rheumatic fever during his childhood and this affected his education, because of his condition he was taught at home by his mother. His health recovered in 1928 so he got a job working as a professional driver and a mechanic, later on in 1930 he joined the Hammersmith branch of the Communist Party of Great Britain and became involved in the National Unemployed Workers' Movement. While in London he was often seen selling the Daily Worker outside Belsize Park tube station. In 1933 he led a strike at the Firestone tyre factory and this earned him the nickname 'Bill Firestone'. After the strike he became the South Midlands organiser for the Communist Party. Hereward House School is a preparatory school for boys aged 4 to 13, located in Hampstead, London on 14 Strathray Gardens, near to Swiss Cottage and Finchley Road. There are currently 171 boys being taught there as of February 2019. The Headmaster is Pascal Evans with four others completing the senior management team: Leonie Sampson (Chair), Nicholas Arnold (Deputy Head), Nikki Scaffidi (Head of the Middle School), and Rosie Batchelor (Head of the Junior School). Hereward House prepares boys for London day schools (chiefly Westminster School, St Paul's School (London), Highgate School, City of London School and University College School) as well as boarding schools. The school's aim is to provide a lively, stimulating and intellectually demanding education in a friendly and well disciplined environment. Modern approaches are employed alongside those traditional methods that have proved their worth. The school is split into three sections: The Junior School (Transition and Years 1 and 2), The Middle School (Years 3, 4, and 5), and The Senior School (Years 6, 7, and 8). Within the school, Year 7 is called CE2 (two years from Common Entrance; Year 8 is called CE1 (one year from Common Entrance). Each boy is also allocated to a house: Angles, Danes, Normans or Saxons. As is customary in preparatory schools, lively and varied competition exists between the houses, including House cricket, football, dodgeball and a sports day. Prefects are elected by staff in September after interviews are held: specific powers (or privileges) are given to the prefects, who are expected to lead by example and perform light policing duties. A number of clubs are offered after school including, cricket, hockey, basketball, chess, art, coding, Judo, quiz, yoga and prep. Hillfield Court is a prominent art deco residential mansion block in Belsize Park, in the London Borough of Camden, built in 1934. It is located off Belsize Avenue and can also be accessed from Glenloch Road. It is one of the many purpose built mansion blocks on Haverstock Hill between Chalk Farm and Hampstead. It is close to the amenities near Belsize Park tube station, as well as the shops of Belsize Village, South End Green and Hampstead. The London Underground is a metro system serving a large part of Greater London and parts of Buckinghamshire, Hertfordshire and Essex. Seventy-one of the 270 London Underground stations use buildings that are on the Statutory List of Buildings of Special Architectural or Historic Interest, and five have entrances in listed buildings. Buildings are given one of three grades: Grade I for buildings of exceptional interest, Grade II* for particularly important buildings of more than special interest and Grade II for buildings that are of special interest.The Metropolitan Railway's original seven stations were inspired by Italianate designs, with platforms lit by daylight from above and by gas lights in large glass globes, and the early District Railway stations were similar; on both railways the further from central London the station the simpler the construction. The City & South London Railway's architect Thomas Phillips Figgis designed red-brick buildings topped with a lead-covered dome containing the lift mechanism, such as the Grade II listed station at Kennington. The Central London Railway appointed Harry Bell Measures as architect, who designed its pinkish-brown steel-framed buildings with larger entrances. In the first decade of the 20th century Leslie Green established a house style for the tube stations built by the UERL, which were clad in ox-blood faience blocks; eleven of these stations are listed. Harry W. Ford was responsible for the design of at least 17 UERL and District Railway stations, including the listed Barons Court. The Met's architect Charles W Clark had used a neo-classical design for rebuilding Baker Street and Paddington Praed Street stations before World War I and, although the fashion had changed, continued with Farringdon in 1923. In the 1920s and 1930s, Charles Holden designed a series of modernist and art-deco stations, some of which he described as his "brick boxes with concrete lids", many of which are listed, five at Grade II*. Holden's design for the Underground's headquarters building at 55 Broadway including avant-garde sculptures by Jacob Epstein, Eric Gill and Henry Moore, incorporates St James Park station and is listed Grade I. The Northern line is a London Underground line that runs from south-west to north-west London, with two branches through central London and three in the north. It runs northwards from its southern terminus at Morden in the borough of Merton to Kennington in Southwark, where it divides into two central branches, one via Charing Cross in the West End and the other via Bank in the City. The central branches re-join at Camden Town where the line again divides into two branches, one to High Barnet and the other to Edgware in the borough of Barnet. On the High Barnet branch there is a short single-track branch to Mill Hill East only. For most of its length it is a deep-level tube line. The portion between Stockwell and Borough opened in 1890 and is the oldest section of deep-level tube line on the Underground network. There were about 294 million passenger journeys recorded in 2016/17 on the Northern line, making it the busiest on the Underground. It is unique in having two different routes through central London. Despite its name, it does not serve the northernmost stations on the network, though it does serve the southernmost station, Morden, as well as 16 of the system's 29 stations south of the River Thames. There are 50 stations in total on the line, of which 36 have platforms below ground. The line has a complicated history, and the current complex arrangement of two main northern branches, two central branches and the southern route reflects its genesis as three separate railways, combined in the 1920s and 1930s. An extension in the 1920s used a route originally planned by a fourth company. Abandoned plans from the 1920s to extend the line further southwards, and then northwards in the 1930s, would have incorporated parts of the routes of two further companies. From the 1930s to the 1970s, the tracks of a seventh company were also managed as a branch of the Northern line. An extension from Kennington to Battersea is currently under construction, which may either give the Northern line a second southern branch or may see it split into separate distinct lines with their own identities. It is coloured black on the current Tube map.